I’ve found a new favorite fall recipe! This quinoa stuffed roasted acorn squash is so delicious and super easy to make. Although it takes 40 minutes to roast the squash, the prep time for this yummy dish is short. If you’ve never had acorn squash, it tastes similar to butternut squash, but slightly less sweet and a little nuttier instead. The texture of acorn squash is stringier than butternut, but it is still easy to eat. The stringiness isn’t apparent when you eat it. To avoid an acorn squash that is too stringy, chose one with dull skin. It’s good to have some orange color to the skin, but too much indicates that the squash is over ripe. Over-ripeness can cause stringiness. Acorn squash that is shiny was probably picked before it was ripe and won’t be as flavorful. I hope your family enjoys this roasted acorn squash dish as much as mine does! Cut each squash in half lengthwise and place on a large baking sheet, flesh side up. Spread softened butter over the flesh side of the squash. Drizzle the maple syrup over the squash halves. Sprinkle with 1 tsp of ground cinnamon. Place the quinoa, 1 tsp salt and water in a pot. Heat over high heat until the water comes to a boil. Reduce heat to very low and put a lid on the pot. Cook, without stirring or removing the lid, for 15 minutes. When the quinoa is done, stir in remaining 1 tsp of ground cinnamon. 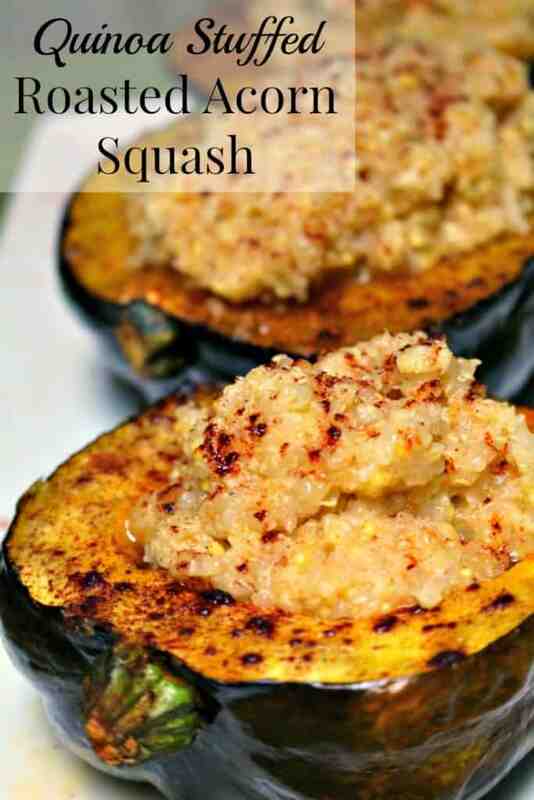 Spoon the quinoa into the squash halves and serve. The quinoa would be great with raisins, diced dried apricots or apples mixed in.